Losing one or more of your teeth is a serious problem in itself, yet it can also have a snowball effect and lead to the deterioration of your overall dental health. As your remaining teeth attempt to overcompensate for the loss, they could become severely misaligned and maybe even get loose and fall out. At Hullmark Dental, we are proficient in implant dentistry and cater our treatment to your individual needs and aesthetic preferences. 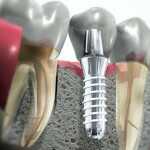 A dental implant consists of two parts: a titanium post, and a crown (or cap). Our experienced dentists will fuse the titanium post to your jawbone in a process called Osseointegration. Throughout the healing process, the implant becomes part of your jaw while simultaneously creating an anchor for the final restoration. We will attach a dental crown onto the implant once it has fully fused to your bone. The restoration will be designed to closely match the colour and structure of the surrounding natural teeth. The entire implant process may take anywhere from 3-6 months depending on the quality of bone and location of the implant. Dental implants are quickly becoming the preferred way to replace a natural tooth: Once your new implant is fully healed and the crown is placed onto it, it will attain the strength, function and appearance of the original tooth. Although dental implants are meant to last a lifetime, they require the same daily care and maintenance as your natural teeth. Dental implants can be used to replace a single missing tooth, several missing teeth or the entire upper or lower jaw, ask us if implants are the right choice for you.